How will this affect the accreditation of the UNC system schools? These types of policies were an issue at least one university. Those in Raleigh will not care. To say that Dan Forrest is "against" free speech because he supports the "Campus Free Expression" bill shows that the writer is totally ignorant of the situation on America's college campuses or an attempt by the writer to intentionally mislead his readers. As a part of the ultra liberal war against free speech when it hurts the feelings of "social warriors": these "warriors" believe that those who are not politically correct in all they say should be prohibited, by law, from speaking their mind or expressing an opinion which does not agree with the "warrior's" view. As a part of their activity on behalf of this belief the "warriors" have taken it upon themselves to assault those who try to attend speeches by those with which the "warrior's" disagree, they have shouted down, tried to block off and otherwise prevent speech with which they do not agree. It is easy then to understand why ultra liberals are against the bill; they would no longer be able to regulate speech on college campuses. 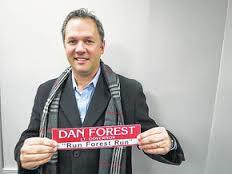 It is not Dan Forrest trying to oppose free speech, it is Dan Forrest trying to prevent self-appointed "social warriors" from stifling any speech which does not tow the ultra liberal line. It's pretty darn clear that this attempt to squelch expressions counter to the conservative element is not intended to foster free speech but rather to muzzle any opposition or contrary opinion.